In Outward it is essential that you have a good weapon. Although you can get several for free at the beginning of the game they will not be the best weapons, they can however be used to help get better weapons. The following guide will tell you the best weapons in the game and where and how to get them. This weapon is found in then northern part of Chersonese in the Bandit Camp, it is a one-handed weapon that deals 29 damage. Once you have defeated the leader of the bandits you need to check his corpse to find a key to the adjacent throne room. The entrance to this throne room will be built from a large barred door and it is there that you will find the Brutal Club along with some other useful items. This weapon is found in then northern part of Chersonese in the Bandit Camp, it is a two-handed weapon that deals 28 damage and belongs to the leader of the bandits. At the Bandit Camp you have to face several bandits which are not particularly difficult to defeat if you can avoid their attacks. 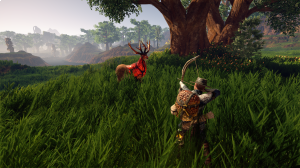 The leader of the bandits however is a different matter, to defeat him you will need to constantly move and dodge his attacks as they deal a large amount of damage. Before entering the Bandit Camp it is advised that you take the Life Potion and a temporary weapon ugprade called the Ice Rag or Fire Rage with you, these items can be purchased from an alchemist named Helmi Cierzo and you will find them useful to have. This weapon is found in the north-western part of the map when you make your way to the Bandit Camp. If you take the road that has the wooden, semicircular structures when it forks it will lead you to the Blister Burrow and the entrance to a cave. Inside the cave you will find corpses and the Simple Bow which is a ranged weapon that deals 23 damage. The Simple Bow cannot be enchanted and there is an autolock when you get close to an enemy. It is partiuclarly effective for taking down bandits and hunting making it one of the best weapons in the game. The Plank Shield is a basic shield that looks as if it has been hastily built from broken planks. You will find it at the port in the western part of the city of Cierzo. The Plank Shield grants the ability to block arrows and although it has the coefficient of Impact Resistance equal to 10 it is unlikely to last long in a fight. The Felling Greataxe can be found in the eastern part of the city of Cierzo in front of the Town Hall on some boxes. It is a two-handed axe that deals l8 damage. Check out our How to Craft Weapons page to learn how to craft the Plank Shield.